Live Luxe: Epileptic - David B.
I'm the wormiest of bookworms and am never more than an arm's length away from a good read. But it isn't often I'm moved to tears. 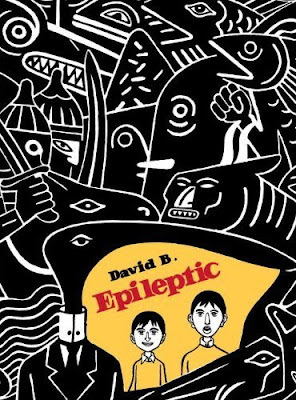 David B's beautiful autobiographical work, Epileptic is a memoir of isolation, loneliness, and the noble quest for identity, all rendered in stunning, ferocious imagery. He shared an idyllic childhood with his older brother and younger sister, until his brother developed a violent form of epilepsy. It chronicles his evolution into an artist, and how learning to re-envision and recreate the world with his eyes and hands offered understanding and an escape route from the madness and disease that consumed his family. For those of you who think that comics are for children, think again. Epileptic is a hauntingly sophisticated and emotionally-gruelling story, woven with a dreamlike quality with insights that will resonate with all of us. What I loved was his portrayal of two sides of human character- his brother who ultimately gave in to his demons, and David, who fought with every ounce of his being. I have had the privilege to meet many people in my travels across the grid. People like his brother, who hide behind their illnesses, using them as a shield to protect them from the harsh realities of life. And people like David, who struggle continually onwards, never giving up and never giving in. I count both as friends - learning from one, and aspiring to the other. I am reminded that the true beauty of SL lies in its ability to liberate you from the shackles of the physical, and to transport you to the most magical reaches of your mind, and your heart, and your soul. However there is always the danger that if you're not careful, your refuge may become your prison. As for me? I have wings, and I love using them.